I never had a fireman, doctor, or cowboy stage. I always wanted to be an artist. I didnt know what being an artist meant, but I did know that making images is what made me feel most alive and connected to the world. It still is. As a child I was always getting into trouble for staring at people. The thing I wanted to look at then and still want to look at now is the figure, or on occasion a space or objects permeated with the figures heavy absence. I work simultaneously in several different print and paint mediums. I choose each medium for its specific qualities, which dictate my process and become an active participant in the final image. In printmaking my overriding interest is in the multiple- not as a way of producing an edition, a run of a single image, but as a way of producing variations on a theme. These variations occur through working proofs, multiple states, varied inking, material choices, and chance. In painting, color takes center stage along with in the case of oil paint a visceral physical presence. De Kooning said it best when he said flesh was the reason oil paint was invented. I am often asked if I am a painter or a printmaker. The answer would be neither- I am a drawer. Drawing is the most essential and direct form of visual communication. All of my other mediums are rooted in the practice of perceptual drawing with its constant negotiations between what you see and what you think you see, what you know and what you think you know. My works paintings, prints, and drawings deal with the figure and with questions regarding the human condition. The human conditions basic elements, the search for lifes meaning, inevitable loneliness, desire for gratification through food or intimacy, and the omnipresent knowledge of our own mortality are all themes in my works- sometimes implicitly, sometimes explicitly. These facts of the human experience have caused me to become obsessed with portraying the skins meaty physicality, vulnerability, and poignantly beautiful imperfections. The corporeal material of the body finds its counterpart in a direct and purposefully unpolished mark. The people, places, and objects portrayed are primarily those I know best and interact with daily. My stated visual interests manifest themselves two different albeit complementary and intertwined, bodies of prints and paintings: 1) observational portraits and nudes and 2) works that are narrative or symbolic in content. 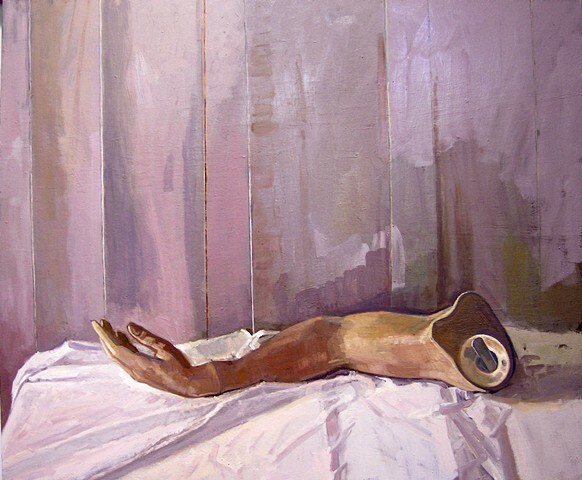 In the first, I record my subject matter through a direct, prolonged, and rigorous scrutiny of the figure. I place my emphasis on the formidable challenge of rendering my physical sensations of light, form, space, and color, as filtered through my interest in the corporeal qualities of the figure. This practice follows directly from my training and teaching in life drawing. Through repeated looking I aim to produce images that neither evoke the icy stare of the clinician nor suggest the subjective exaggerations of expressionism. These observational works call into question the act of looking and our assumptions about the appearance of the thing most familiar to us, the figure. I want these works to be formally rigorous and yet contain the smell and feel of the human body. The artists I look to again and again to inform this pursuit are Rembrandt, Degas, Cezanne, Giacometti, and Lucian Freud. The second body of work is more overtly narrative and symbolic. In it, I attempt to make visible the disjunction between our shared external reality and our internal stream of consciousness a dialogue only hinted at in the more purely observational work. These images usually start in my imagination rather than observation and reach fruition through a combination of observational painting and pictorial invention. I want these works to have the same corporeal presence as my more straight-ahead depictions with the added emotion or psychological punch of unexpected content and juxtaposition. I look to Goya, Courbet, Kollwitz, and Beckmann as models for this specific inquiry.